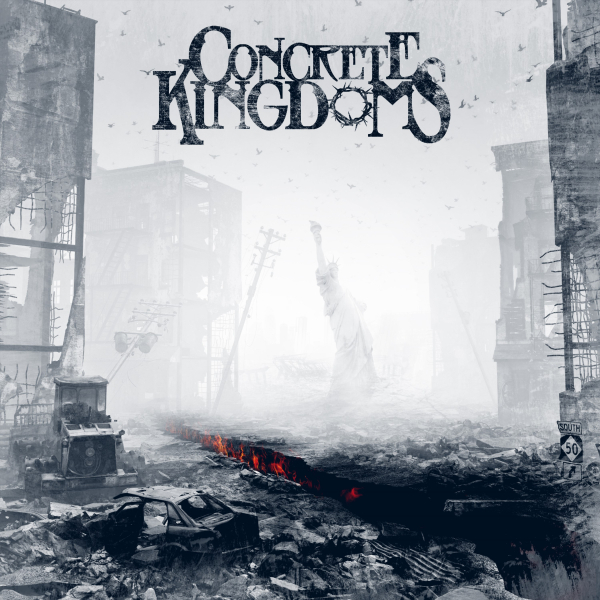 When you’ve got an EP like Concrete Kingdoms’ debut, you’re going to want to celebrate its release. Three bands to precede them, each with their own sound but they all fit within the hard rock camp and reflect the different elements in the headliner’s sound. Add in a ridiculously cheap asking price on a Friday night and you have the makings of a great night. First to take the stage are Brora Wolf, much like the rest of the bands on tonight’s bill, they’re a tight unit. Opting for a more groove-based route, there’s an early 70’s feel to them especially in “Saints and Sinners”. Whilst they’re intent on playing their hard rock wares, they manage to bring it down at the halfway point with their only ballad of their short set. Meanwhile, their namesake track “Brora Wolf” brings things to a close. They’re received well by the already size-able crowd as opposed to the polite applause which can so often be the case on nights like this. They set a high standard for the rest of the bands to match and a sure sign the rest of the night is going to be a good one. Tomorrow is Lost opt for a more modern sound, rattling through the material they’ve got such as their upcoming single “Shadowman” and a cover of Sia’s “Electric Heart”. Frontwoman Cass King makes full use of the stage and with the crunching guitars from Joe McDermott and Ryan O’Hara, draw from the usual big modern-day influences as well as nods to the less obvious ones. For a band in their relative infancy, they treat the performance as if they’ve been playing together for several years and there’s a great chemistry to the five-piece. They’re back north of the border in a couple of weeks for Winter Storm’s StormBreakers and it’d be hard to imagine any of the bands outshining this lot. Taking the night in a darker slant, Empyre (the very first band who opened our Wildfire stage last year), are out to make sure their trip from the Midlands worthwhile both for themselves and those in attendance. Pulling no punches from the start, they make sure they have the audience’s attention for the duration. The dark yet relatable lyrical content is introduced with self-deprecation – only adding to the dark tone. But it’s met with open arms and the chunky hard rock sound trades riffs for melody, working well as a bridge between the preceding band and for the headliners. As the band show off their efforts for their upcoming debut album, it’s a definite step up and how much they’ve progressed since my last exposure to them – and they were pretty damn impressive last time. Meanwhile, the men of the hour take their place. As guitarist Mark Faulds introduces them onstage with a finessed solo, Concrete Kingdoms are intent to give the best show they’ve ever played. And having seen them a few times now, it can easily lay claim to that. Tighter than ever and running on the adrenaline of playing to a room full of fans (the busiest I’ve seen was Ivory Blacks in some time) alongside finally having their widely-covered EP released, they batter through their set which is over in the blink of an eye. Taking the best of the best hard rock sounds and moulding it to their own sound, the five-piece are in control. Using the benefit of two lead guitarists with the afore-mentioned Faulds and Ben Fraser, they’re both able to play to their individual strengths. With the melody of Alter Bridge, the sneer of Velvet Revolver and AC/DC’s unapologetic ferocity, it’s a testament to how it’s all finely balanced without spreading themselves too thin. As songs like “Same Old Same”, “Speed Demon” and “Die This Day” from the EP are aired, there’s also the opportunity to play a new song in the form of “Get Away”. As the band admits it was a process of fine-tuning it, the wait was worth it with its bass-heavy groove and I look forward to hearing it again. Lead single “Time to Play” brings the original material portion of the night to an end before they end with “Rockin’ in the Free World” and “Rebel Yell”, the former of which sees half the band come out onto the floor to join the enraptured crowd. It’s a triumphant night for Concrete Kingdoms with the crowd demanding more. Nights like these, whilst not uncommon in Glasgow, shouldn’t be taken for granted. Giving the chance to showcase some great talent from across the UK, and there wasn’t a sense of people drifting in and out for certain bands, it’s a successful night for live music as a whole.